Having grown up watching reruns of Star Trek and eagerly anticipating The Next Generation when it hit the air in 1987, I surprisingly never got hooked on any of the shows that followed. Though I had seen a few episodes of Deep Space Nine and Voyager, I had never seen a single episode of Enterprise. With its recent release on Blu-ray, I figured it was the perfect time to give it a shot. It took me a few episodes to get into it, but ultimately I found Enterprise to be an enjoyable show worthy of the Star Trek canon. Enterprise serves as a gap between the events of First Contact, where we see the Vulcans make initial contact with Earth, and the original Star Trek series. Things are not as high-tech in the year 2151 (the year of the pilot episode). The crew eats real food, prepared by the ship’s chef (a character always referred to simply as “Chef” that we never see). 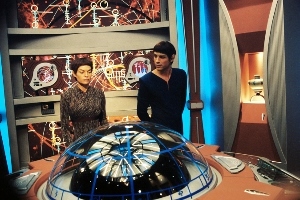 The ship itself looks decidedly lower-tech than in any other Trekseries’ (save for The Original Series). With its very metallic interior, it takes on the appearance of a traditional battleship more than a spaceship. There are references to thing like football and cherry snow-cones, indicating that things on Earth are not all that different yet. One notable similarity to today’s time was the absence of star dates. When the captain records his ship’s log he uses dates from the Gregorian calendar. The big difference that helps drive the show is the lack of the Prime Directive. 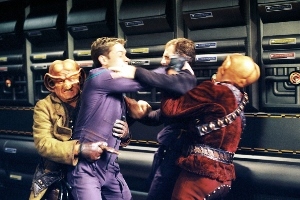 In all the other Star Trek series, the actions of the crew were bound by the Prime Directive, which prohibited interference in the events of other cultures. Without the debate of how the Prime Directive should be followed in any given situation, the show had more of a Wild West type of feel. Of course with a new Star Trek series we get a new Enterprise captain. Scott Bakula plays Captain Archer. Archer is a kind of reluctant captain, though he seems genuinely interested in exploring the unknown. One of the things I liked most about Archer was how close he was with his crew. His second officer (known as the sub-commander), T’Pol (Jolene Blalock), is a Vulcan placed aboard the ship in an exchange program. She takes her job very seriously and never questions her Vulcan teachings. One of the highlights of the series was her hard-earned friendship with the captain and her slow acceptance of human customs. One of my other favorite characters is Charles “Trip” Tucker (Connor Trinneer), the ship’s engineer. Trip was already a friend of the captain’s before the mission, and the two have a playful rapport that I think works well for the show. The series gets off to somewhat of a rough start with the pilot, “Broken Bow: Parts 1 & 2.” The weakness of this episode lies primarily in the backstory about the captain and his father. I found this element to be clichéd and completely unnecessary. The first mission of the Enterprise is to get an injured Klingon back home without starting a war. With the Klingons being friendly in The Next Generation and the following two series’, it’s easy to forget that they were the enemy in the original series. In this case they aren’t all that friendly, but they are not yet the enemy they become later. Instead we are introduced to a new adversary called the Suliban. Some of the Suliban are part of the Cabal, which have genetically modified themselves to a supernatural level. In an effort to keep the show fresh and interesting we are introduced to many new aliens never seen in any other series. While it makes sense that they would do this, it prevents the show from lining up with the other series as well. You would think someone would have run into the Suliban again in the future. Then again the incorporation of a familiar species like the Ferengi didn’t work all that well either. In the episode “Acquisition,” four Ferengi invade the ship to pilfer anything they can get their hands on. The episode is one of the weakest of the entire season. Apparently no one even recorded the encounter because when Captain Picard encounters the Ferengi on The Next Generation, no one seems to know anything about them. It’s just an example of how Enterprise was at a deficit in trying to do something new and be a prequel to everything else Star Trek-related at the same time. However, despite those kinds of issues the show managed to do a pretty good job at telling an entertaining story. Yes, there were a few clunkers in there, but for the most part the show really started to feel like Star Trek after the first few episodes. It took those first episodes to establish the characters and the rhythm of the show, but once it did, I felt the show was off to a good start for a new series. The Blu-ray presentation also gets off to a rocky start, with the pilot looking seriously dated and overly grainy. I was worried the unfortunate lack of sharpness would carry throughout the series, but things improve almost immediately beginning with the second episode. In fact, the season seems to slowly, subtly gain a sharper and more detailed appearance as it progresses. Most of the episodes look pretty good. The 5.1 DTS-HD Master Audio mixes are everything they need to be (crystal clear, plenty of ambiance from the surrounds) without carrying an overtly punchy bottom end. There are some nice directional effects during space scenes involving the ships flying around. For more on the excellent new special features created for Star Trek: Enterprise – Season One, please see our earlier article. Suffice it to say that Rick Berman and Brannon Braga were not afraid to speak openly about the mixed reaction the show received, which makes these new interview essential viewings. All the special features from the previous DVD have been included here as well.